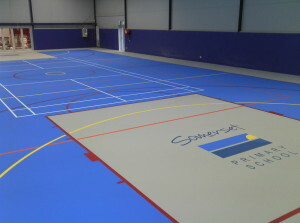 Gecko PU-SPORT® Surfacing System creates an attractive, durable and forgiving surface suitable for a wide range of indoor sport applications. Gecko’s Polyurethane flooring system is imported from Europe using the highest grade materials which ensures excellent durability and maximum slip resistance. The greatest benefit of PU-SPORT® surfacing is the shock absorbing characteristics in comparison to other surfaces. Timber floors generally don’t offer the same protection for younger and lighter weight children when jarring and stress on joints can lead to potential injuries. Suitable for sports halls, gymnasiums, gymnastics, aerobics areas and indoor basketball courts, Gecko PU-SPORT® provides excellent cushioning and slip resistance which dramatically reduces the chance of injury to players. This seamless, one piece court system provides optimal ball bounce, excellent wear properties and an easy to clean and maintain surface. Available in a wide range of colours – even your club or school logo, Gecko PU-SPORT® surfacing is the obvious choice for a premium look and maximum safety. Both the cost of installation as well as the cost of maintenance in recoating timber flooring is far greater than Gecko PU-SPORT®. The original investment in timber flooring is around $200 per sqm, almost twice the price of PU-SPORT®. Annual maintenance costs associated with recoating and regular polishing can be about $10,000 per court. PU-SPORT® virtually eliminates these ongoing costs.